A tall granite obelisk topped by an infantry soldier honors the service of Meriden’s Civil War heroes. 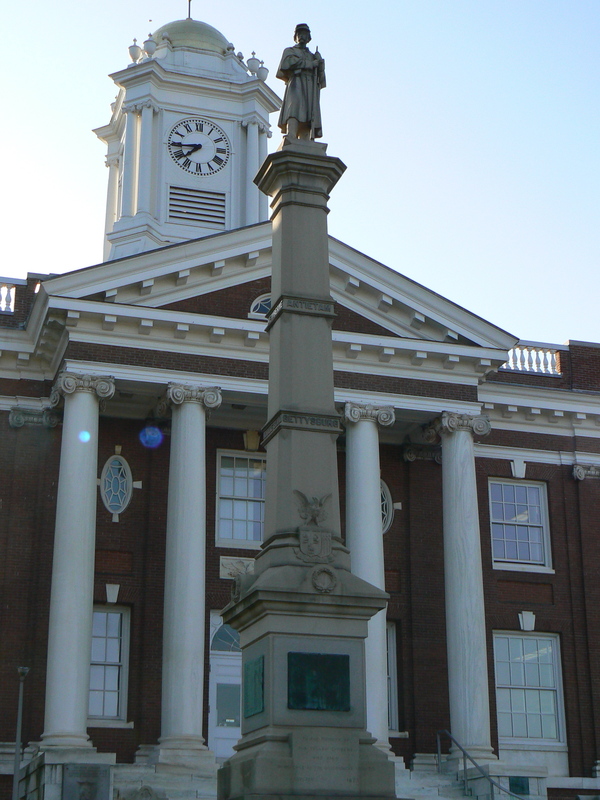 The monument, outside City Hall at the triangular intersection of East Main Street (Rte. 66) and Liberty Street, was dedicated in 1873. The front face, like the other three, also bears a bronze plaque that honors about 40 residents killed in the war by listing their name, rank, company, regiment, place of death and date of death. The names are arranged by their company affiliation, which in several instances groups soldiers killed in the same battles. The memorial plaques are uncommon in that the letters are incised into the plaque, instead of being raised. The Soldiers’ Monument in Norwich also uses this technique. The monument was created by Batterson, Canfield & Co., a Hartford firm that supplied a fair portion of the state’s Civil War monuments. A 1948 granite marker on the south side of the main stairs to City Hall commemorates an 1860 political speech by Abraham Lincoln. A marker on the north side of the stairs, made from metal salvaged from the USS Maine, honors Spanish-American War veterans (identical plaques are displayed in Naugatuck, Bridgeport, Norwich, and several other Connecticut cities). City Hall, a 1907 replacement for a building that burned down, stands atop a small hill, which adds to the prominence of City Hall and the monument in front of it. The site was once surrounded by a fence, but the fence and four cannons were donated to World War II scrap drives. Small pillars decorated with shields stand at the four corners of the monument’s base.